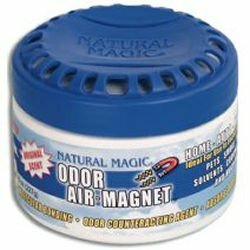 Natural Magic Odor Air-Magnet is a solid gels that works by absorbing odors in the air and converting them to non-toxic, odorless compounds. They work continuously to absorb and eliminate odors as they occur. Choose Original, Lemon or Berry scents. Place all around the house to absorb and destroy airborne odors from: smoke, pets, cooking, bathrooms, stale storage areas, cars eliminates odors from gasoline, boat heads, mildew, paint fumes see below for more uses.